By Melissa Lennig on November 23, 2013 21 Comments. This content contains affiliate links. As an Amazon Associate I earn from qualifying purchases. Last Saturday, I found myself with a morning alone. This doesn’t happen often, so I decided to take complete advantage of it! After a stop at the local coffee shop, I wandered down to my favorite antique store, steaming cup in hand. I don’t keep a large antique collection, but do love to run my fingers across vintage kitchen supplies, toys, magazines, and hats. 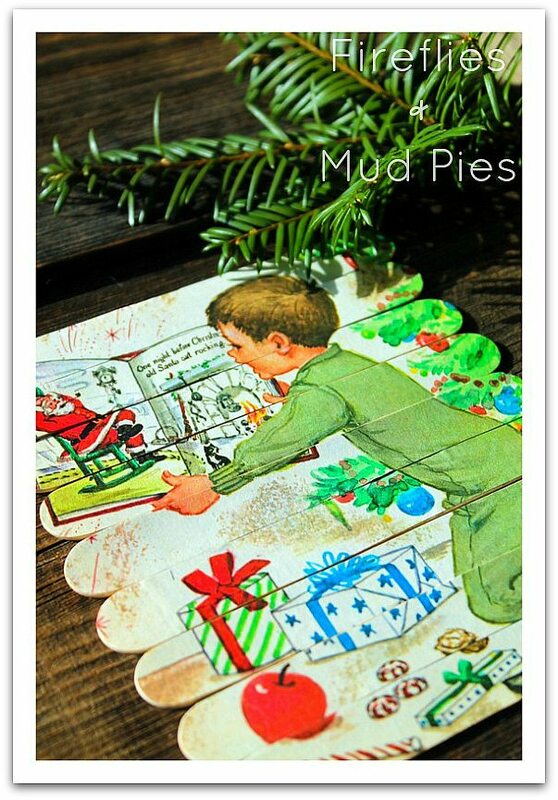 I was hoping to find some vintage Christmas cards to make the boys a collection of Craft Stick Christmas Puzzles, but instead took home a damaged copy of the 1966 Christmas Golden Book, Santa’s Surprise Book, by Joan Potter Elwart. It was perfect for my project! 1. 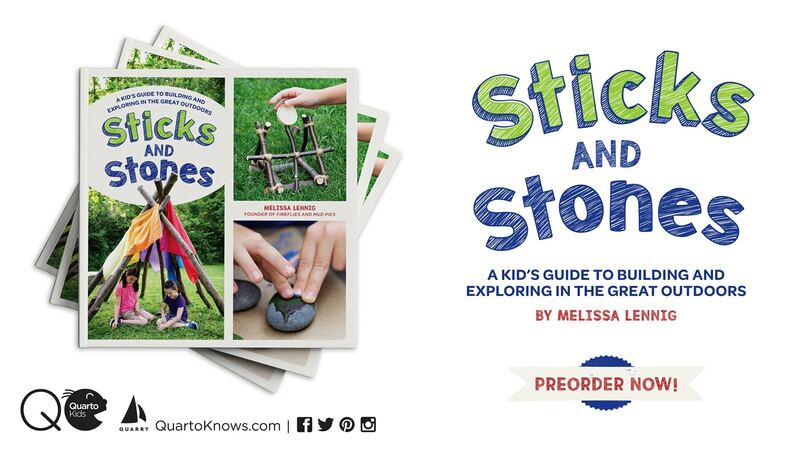 Trace the shape of a craft stick onto the back of the page you plan to use. When you are finished, cut the shapes out and pair each one with a craft stick. 2. Using the paintbrush, generously spread Mod Podge onto each craft stick. Carefully place the paper cutouts over the craft sticks. Press firmly to release any trapped air. 3. After every craft stick has been decoupaged and dried, spread a final thin layer of Mod Podge over the front (and back, after the front has dried) of each craft stick. 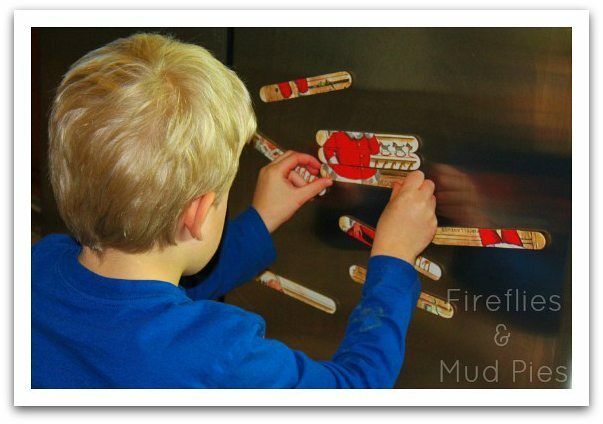 The boys enjoyed putting these simple, beautiful puzzles together…on the refrigerator! Adhesive magnetic tape allows these puzzles to be enjoyed anytime! 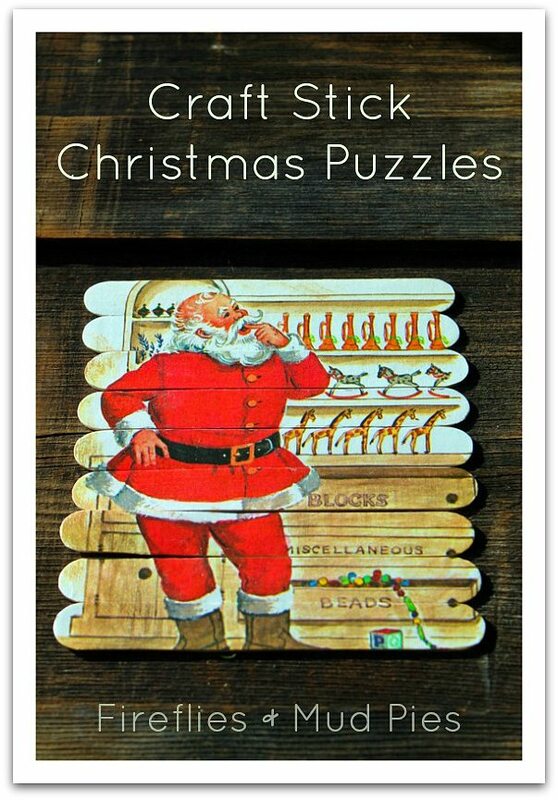 Wrapped with twine and a tag, Craft Stick Christmas Puzzles are a thoughtful DIY holiday gift for a child, or a simple addition to the Christmas stocking. I remember That book wish I could get it.